How to manage seo panel report generation effectively? If you are using seo panel 3.2 or above version, you can limit each cron execution to check only few keywords. But you need to execute cron more than 1 time day according to the number of keywords. 3) Then increase the frequency of cron execution in a day according to total number of keywords. If you have 60 keywords. Then execute cron job 60 / 3 = 20 times a day. Set 'Number of keywords needs to be checked in each cron execution:' to 3. 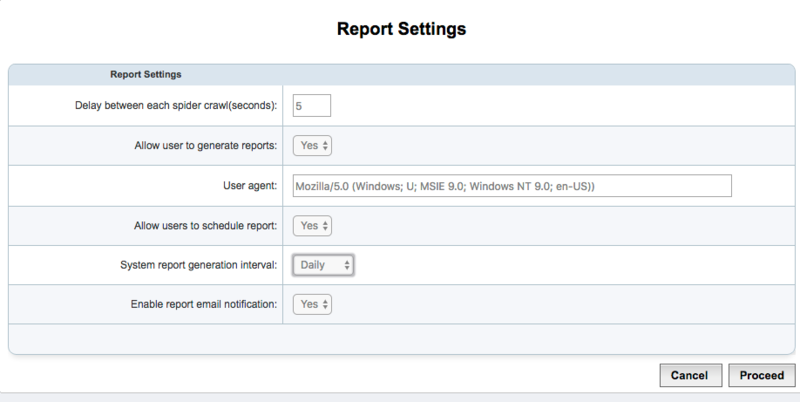 This will help you to generate stable reports. Also you can use proxy to prevent captcha in search results. Please use following steps to enable it. Set up proxy for seo panel using following steps. You can use service of our partner below for getting proxies. This will enable proxy feature in seo panel if any proxy is active in the system. Re: How to manage seo panel report generation effectively? Thanks for this information. Hope this will work for me. that at midnight cron will run and the first 20 terms will be checked, then at 1 the next 20 and this will continue every hour until all the terms have been checked. What happens when all the terms have been checked for that day? So I have 300 terms to check, at 20 terms per check that means 15 hours will be needed. What happens to the remaining 9 times that the cron job runs? Cronjob will run but no reports will be executed because already executed for that day. Hi, will google block search (add CAPTCHA) from my IP, if I put 20 keywords every 2 hours (I have 200 keywords)? I need to know how to prevent Google from blocking search too. Does anyone know what will trigger them to add the captcha and block the IP? This seems to be extremely important in my opinion. Can anyone shed some light on this or is the proxy a required feature that is needed to make this work correctly? My dashboard does not have a location to edit the number of keywords to run each cron as the OP shows. Was this option removed in a recent version, or is it managed somewhere else? How do I change the number of keywords? I manually changed the setting by changing the value in the database directly. I found the setting under the Settings table, with the label SP_NUMBER_KEYWORDS_CRON. I changed it from 1 to 3 and seems to be working for now.